We’re Open Year Round! 6 days/week. On Tuesdays the horseback riding trails are closed. We recommend you make a reservation to ride with us, but we’ll do our best to accommodate you if you drop in. Please call the barn at 905-649-2888 to make a reservation. Group horseback trail ride in our private forest! 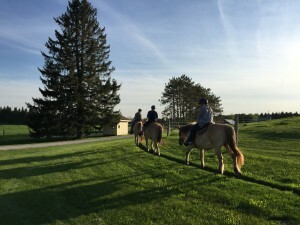 We do horseback trail rides for people who like to experience horseback riding. 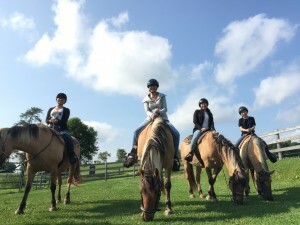 Our horses are trained for trail ride, they are really good with beginners. Pathways on Pleasure Valley can accommodate any level of able-bodied rider, but please note that some restrictions on age and weight may apply. Please note that our minimum age is 10 and up and our maximum weight limit is 225 lbs. Horses & Alcohol Do Not Mix!! Anyone intoxicated or under the influence of alcohol or drug will not be allow to ride. We accept Cash, Debit, Visa and MasterCard. All the price on website are cash price and tax including. We will charge 3% on credit card purchases. All Credit Card and personal information are submitted through a secured site and is only accessible by our office. In most cases, Pathways on Pleasure Valley requests credit card details to confirm your reservation with the trail ride spot, on your behalf. Your credit card may be checked (pre-authorized) to ensure that it is valid. Your credit card details will be used to process the payment for the reservation at the time of booking. If you want to come to Pathways on Pleasure Valley to leave us the 50% deposit on your booking, then you don’t need to give us your credit card information. Can my child ride with me on the saddle? NO, it’s not safe to have more than one person in the saddle at one time. Can I sign a waiver for someone else’s child? NO, every rider under the age of 18 must have a waiver signed by a parent or legal guardian. If you’re bringing someone else’s child, print out a waiver and have it signed by a parent or guardian before you visit. Can we walk out on your horseback riding trails or ship-in to ride on your trails? Our apologies, but due to safety and liability concerns, our trails are not for public use. What to wear or not to wear for trail ride? Best to wear jeans, legging, or trousers. Shoes must cover your entire feet. NO open-toed shoe are allowed around horses or riding areas. How many people will be riding in a group? To control the quality of the trails, we take maximum 8 people out at a time. More riders on a ride is possible if requested prior to setting up the appointment. Can we bring our dog(s) to Pathways on Pleasure Valley? NO, we have our own Ranch dogs that might not appreciate the visitors, and it’s also dangerous to bring new dogs to a working farm; so please leave your dogs at home. Do NOT plan on leaving your dog in the car while you visit. Please be aware when making a reservation that we are guaranteeing that we will have horses and a guide available for your ride. You will be required to arrive 30 minutes prior to your ride for instructions. All our Trail Ride activities have a 24 hour cancellation policy. Without 24 hours notice if you do not arrive for your scheduled time, your credit card will be charged 100% of the ride value. 100% non-refundable.Please note that this policy is non-negotiable. There are no exceptions. All rides operate rain or shine. In the event of bad weather here we allow you to reschedule your ride. Cancellations will be charged 100% of your ride value. For reserving the credit card is required for pre-authorization and full payment can be made the day of your ride in cash or credit.